The Energy Education Council reminds people that while they are taking time off from their everyday life, their electric bill might appreciate a vacation too. They share five ways people can reduce energy costs while away on vacation. We want people to enjoy their vacations and keep their homes as safe and efficient as possible when they are away. From packing a suitcase to booking flights, there is a lot that goes into planning a vacation. The Energy Education Council wants to remind people that while they are taking time off from their everyday life, their electric bill might appreciate a vacation too. “We want people to enjoy their vacations and keep their homes as safe and efficient as possible when they are away,” said Molly Hall, EEC executive director. Unplug. Many household appliances continue to use electricity even when turned off. This is known as phantom power draw. Unplugging these items not only saves energy, but in some cases, can prevent fires. Unplug all appliances that will not need used while on vacation. This includes entertainment systems, computers, and microwaves. Turn down the water heater. According to Energy.gov, water heating accounts for 14 to 18 percent of an average home’s utility bill. Water heaters use a lot of energy to store water at a warm temperature, which is not needed while on vacation. Turn the water heater to the coolest setting. 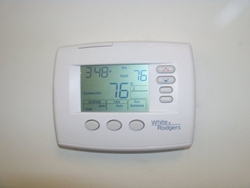 Use a programmable thermostat. Set the thermostat warmer than typically comfortable. Doing this can cut cooling costs. A programmable thermostat can adjust the temperature automatically, and can cool the home again by the time the vacation is over. Utilize blinds and curtains. Window treatments are not just for home decoration; they can help with energy efficiency too. Close all blinds and curtains before heading out on vacation to help prevent solar heat gain. This helps keep the home cooler and reduces the use of the air conditioner. Install programmable timers. Many choose to leave household lights on for security reasons. While this can provide peace of mind and deter burglars, it can also waste energy if lights are left on the entire time away from home. A programmable timer allows for lights to be on at specified times and prevents lights from overheating. For more tips on keeping your home safe and efficient year-round, visit EnergyEdCouncil.org.